I had two sorry looking pears staring in my face whenever I opened the fridge for something. 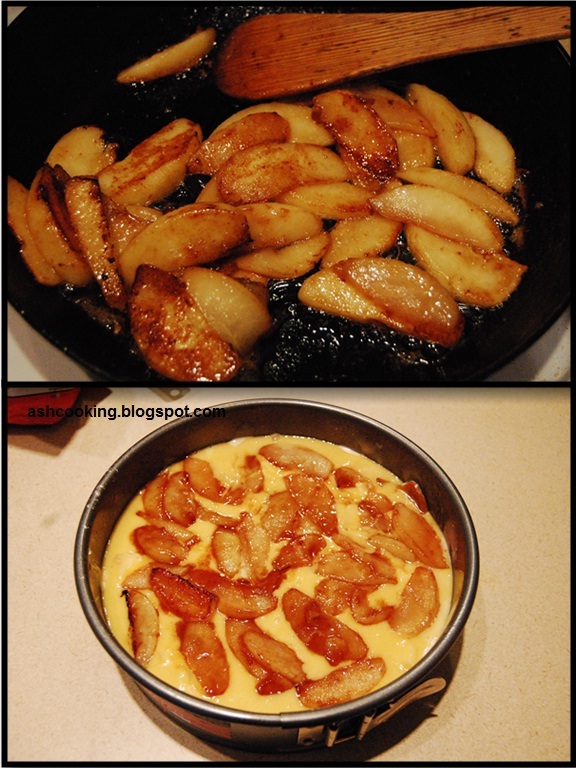 Not knowing any other way to put the over ripe pears to their best use, I decided upon baking them one day. There were some apples too yelling at me in order to grab my attention. Who likes to be tossed away in dustbin? 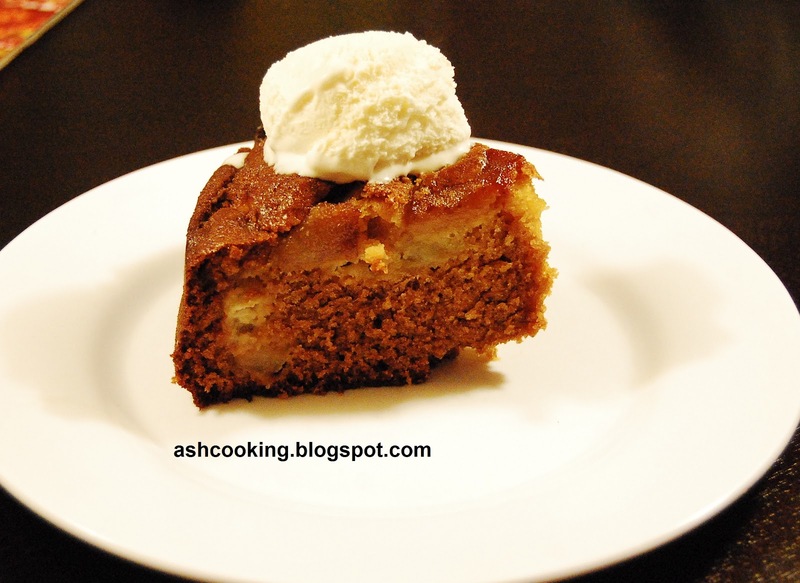 So I incorporated both apple and pears in my recipe. Must I mention on this pretext the vanilla pudding mix, which I bought couple of months back for some reason I forgot, served usefully enhancing the taste of the cake. You never know which thing comes useful when. So my fridge remains usually stuffed with lot of unusual items. Since I abhor wasting food, I make sure that everything in the pantry is used up on time. 1) First of all, separate the dry ingredients from the wet ones. 2) Mix in the wet and dry ingredients separately in two bowls. 3) Using a hand blender or an electric beater, whisk the wet ingredients - eggs, butter, honey, milk and vanilla essence to a smooth frothy consistency. 4) Similarly combine the dry ingredients - flour, sugar, vanilla pudding mix, baking powder and soda. 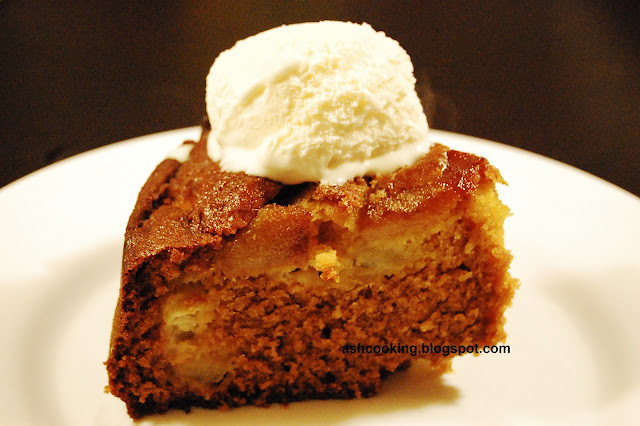 6) Once pears are done with caramelization, keep them aside to cool down while you get the cake batter ready. 7) Pre-heat the oven to 350° F/180° C.
8) Fold the wet ingredients gradually into the dry ingredients and incorporate till no speck of flour is in sight. 9) Mix in the chopped apple and stir in once. Grease a baking dish with required amount of butter and flour. 10) Transfer the cake batter to the baking dish. Carefully place the caramelized pears on top. 11) Bake the cake in oven for about an hour till a toothpick inserted at the centre comes out clean. 12) Serve at room temperature topped with a scoop of vanilla ice cream.